Arcade games are one of the few novelties of the 80s that have survived the test of time. While hair bands and piano key neckties have fallen by the wayside, arcades have continued to prosper. They’re like the perennial pop culture cockroach, feeding off nostalgia like Pac-Man on pac-dots and assorted fruits. Here are our favorite arcades where you can relive your glory days as a pinball wizard. This family fun center is like something out of a kid’s dream. The attractions include laser tag, go-karts, bumper boats, and mini golf. Inside the park lies Cyber City—a 5,500-square-foot video arcade. Kids can enjoy everything from skee-ball to indoor simulation games as well as arcade games like “Fast and Furious: Super Cars” and “Time Crisis.” The clubhouse also has prizes for kids that redeem their hard-earned tickets. With a name like Play ‘N Win, it should come as no surprise that this arcade bar is near a casino. In fact, Play ‘N Win is part of Harrah’s Ak-Chin circle’s new UltraStar Multi-tainment Center. There isn’t any money to be won, but there are definitely still thrills. This arcade bar includes standard games like skee-ball and air hockey. They also have newer arcade style games such as “Haunted Manor,” “Deadstorm Pirates,” and “Super Bikes 2.” They’ve also implemented a player card system meaning credits and points load straight to a card and limit time searching for pocket change. Gypsy Bar is a nightclub for arcade enthusiasts. There are drinks, DJs, dancing and 40 mega-sized arcade games. This 10,000-square-foot adult playground is a trendy downtown spot that has redefined the arcade experience. Grab your favorite cocktail and head to the arcade lounge to compete in some friendly gaming. Games include “Guitar Hero,” “NBA Hoops,” “Pac-Man Battle Royale Deluxe,” and Sega’s “Big Bass Wheel.” Gypsy Bar has also included a game card reward system with prizes ranging from Pez dispensers to electronics. Freedom Station Family Fun Center has Northern Arizona’s best–and biggest–game room. This amusement center includes fun for all ages and contains a rock climbing wall, laser tag, and mini golf. Their arcade room includes old school games like pinball, pool and air hockey. It also has fun new additions like “Wheel of Fortune,” “Monopoly,” and “Deal or No Deal” games and a prize-filled redemption center. 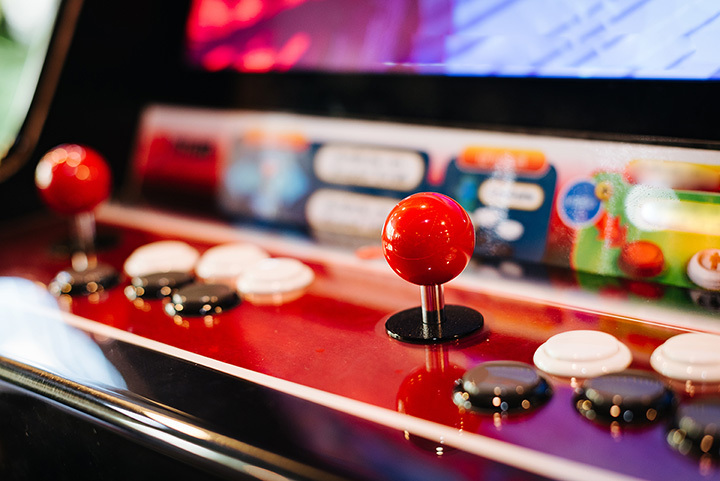 The Grid firmly follows their motto of “Games and Growlers.” This bar/arcade is a nostalgia and geek inspired throwback to the heyday of arcade popularity. Even without arcade games, this venue would be impressive. They feature live bands and DJs on the weekends in addition to a full bar and craft beer. Their arcade section is filled with old school favorites like “Tron,” “Teenage Mutant Ninja Turtles,” and “Initial D.” The crowd favorite is “Killer Queen”–the world’s only 10-player arcade strategy game. This hybrid waterpark and amusement center is the most impressive venue on this list. Featuring over 30 rides and attractions, families can spend well over a day without hitting everything in the park. In King Ben’s Castle lies an arcade wonderland. Their list of over 200 arcade games includes 80s classics like “Q-Bert,” “Donkey Kong,” and “Ms. Pac-Man.” There’s also driving games like “Initial D,” dance games like “Dance Dance Revolution,” and tokens galore. Dave & Busters selection of familiar games is legendary–from the many skee-ball, Pop-a-Shot, and air hockey stations located throughout. They have too many arcade games to list, but rest assured they would not disappoint. Additionally, their fun food, drinks, and energetic atmosphere make any Dave & Busters worthy of this list.